This year, the only Easter chocolate I bought was an Easter bunny my Luusmeitschi knocked off a shelf in our local Chäsi, but somehow we still have more than I know what to do with. Easter weekend at my in-laws saw a stock of chocolate bunnies and eggs large enough to last until the first snows (see photos below). And when Sam and I went on a mini-break to Ticino earlier in the week, my father-in-law gave us a bag of chocolate eggs heavier than my husband's camera. For a "snack" on the train. Now for the challenge of using those bunnies—and what better way than an excuse to eat chocolate for breakfast? It's a great way to use leftovers—both bread and chocolate—and super simple to boot. The recipe is a family standard and flavouring and quantity can be adjusted at will. Butter a large baking dish, then add the cubed bread in an even layer. In a small pot, heat the milk, butter, and orange zest until simmering. Take off the heat. Whisk together the eggs, sugar, and cinnamon. Pour this over the bread and stir gently or use your hands to make sure the bread is fully covered with liquid. Once the milk is still warm, but not simmering, pour it over the bread. Sprinkle over the chocolate, pushing some pieces down into the bread mixture. Cover the pudding and chill for about an hour. Preheat oven to 180 C / 350 F / gas mark 4. 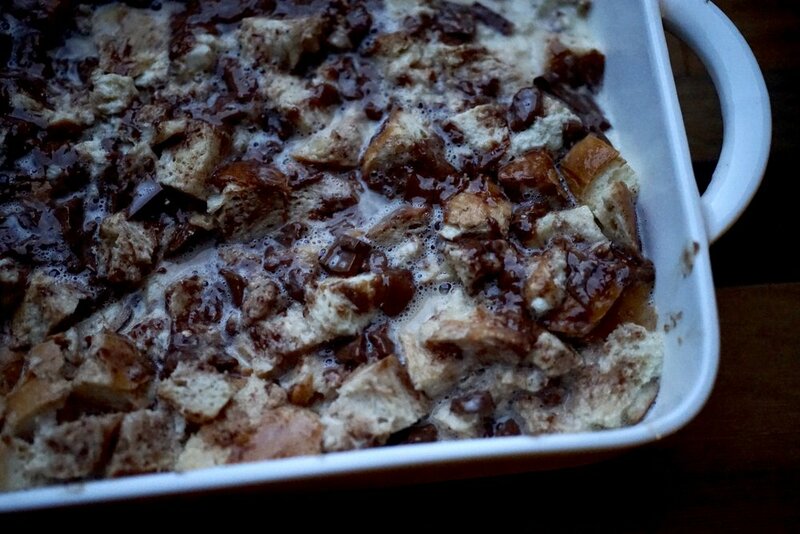 Bake for about 40 minutes or until the chocolate is melty and the exposed bread bits have browned a little. Any stale bread will do here, but Zopf is especially delicious. Stale bread absorbs the liquid better, so if your bread isn't really dry you can first spread it on a baking sheet and toast it in the oven. You can use a round or rectangular pan, ceramic or metal, deep or shallow, just spread out the bread evenly. Shallow pans will have a slightly shorter baking time. The orange and cinnamon are just suggestions—you could omit these or use other flavourings like vanilla, ginger, or booze. Make a mocha flavoured pudding by replacing a third of the milk with strongly brewed coffee. Looking for more Easter recipes?